Your donation goes towards individualised care for Hagar clients in the form of trauma recovery, safe accommodation, legal support, education, economic empowerment and community reintegration. But recovery in itself is not the end goal for us – we set our sights on a much higher target. Your donation is an investment in the future of women and children. Time and time again, our clients have proven us right – with time, they can move beyond their pain to become advocates, leaders and agents of change within their communities. For each individual that we support, our experience is that a further 4-6 people in their household will be positively impacted. This means that empowering survivors to live full lives has an incredible multiplier effect, providing returns for generations. Monthly giving is a convenient and effective way of giving as it enables us to commit to longer term planning and allocate funds to the most critical needs as they arise. The flexibility this affords makes all the difference in time-critical situations such as emergency surgeries or aid in conflict situations. “Giving to HAGAR on a regular basis rather than a one-off gift helps me exercise good stewardship of my financial resources as it is a mid-term commitment which also ensures a relational aspect to this stewardship, so that I’ll continue to be reminded to support the work in other ways, whether it be prayer or support. 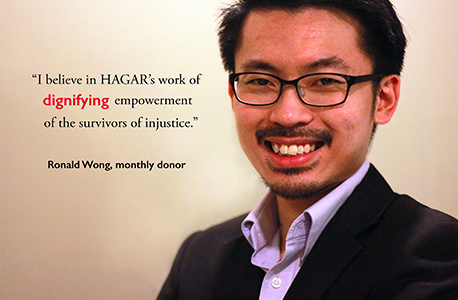 I believe in HAGAR’s work of dignifying empowerment of the survivors of injustice.” – Ronald Wong, monthly donor. Read how these women and girls survived their ordeals, and are now living a full life. Our Empower Campaign helps women in their journey of recovery. For just $50 a month, you can provide them with the necessary skills and support to start a whole new life.